I just can’t hide my affection for the Faderfox line, and one unit in particular: the UC3 was pretty close to perfect. 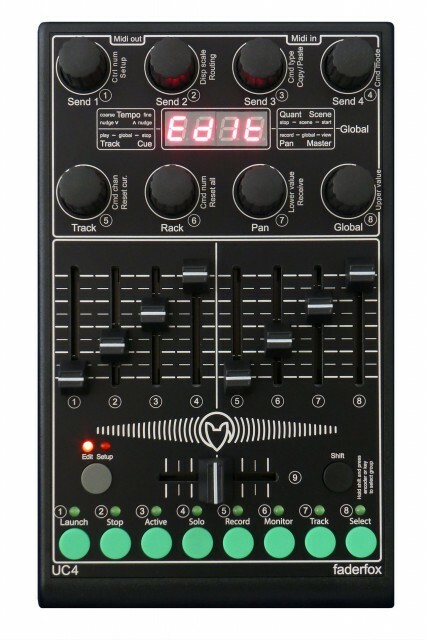 While there are other MIDI controllers with faders, the UC3 stands out by combining a healthy assortment of encoders and faders (plus one crossfader) in an ultra-compact, lightweight package. Nothing comes close to saving space either in your bag or in cramped performance setup situations. Every component feels smooth, solid, and premium, in contrast to rivals that have generally favored low price over quality. And it’s USB class compliant, so drivers aren’t issue. Well, the UC3 was nearly perfect. While it supports USB, it doesn’t have MIDI in and out capability, so you can’t use it standalone or to connect hardware. And while the encoders are push-buttons, you can’t transmit MIDI control messages using that functionality (they’re only pre-mapped to internal function, selecting groups). Enter the UC4, the UC3’s successor. It adds MIDI support and push-button control as I’d asked for, plus a bunch of other nice things that I didn’t. MIDI in and out, works standalone. 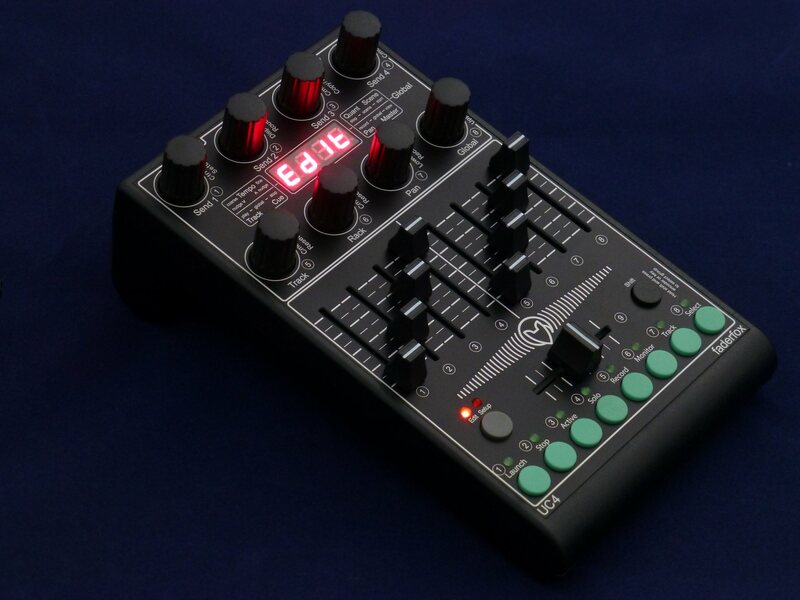 USB is still there, but – as on the excellent SC4, you can use the UC3 standalone and as a MIDI interface with external hardware. (My SC4 turned out to be invaluable just Saturday evening when I realized I’d forgotten a MIDI connection.) MIDI is provided via minijack ports, and MIDI DIN breakouts are in the box, though… boy, I’d like to see stereo minijack just turn into the new MIDI standard. There are already a few devices that work. Encoder push buttons are programmable. This is the other big one for me. The encoders on the UC3 were already push-buttons, which made me immediately want to be able to assign them to control software. Done. Trigger buttons. These are new on the UC4, and each has a corresponding LED. They’re pre-mapped and silkscreened for launching and transport features, and work out of the box accordingly with Ableton Live 8-9, but you could map them to anything you like. This looks useful, but it comes with one downside – the faders have a shorter throw. Editable group names.. Now this is a clever idea, and one that oddly I can’t think of on any hardware I’ve used. Too bad I’ve already learned how to memorize group numbers on my UC3! More precise encoder control. The encoders themselves are the same on the UC4 as the UC3, Faderfox tells CDM, but the controller chip is faster, resulting in more precision. Remember that the UC4 (like the UC3 before it) also features 14-bit MIDI messages, so you can have more precision than 0-127. This is especially appealing to me when controlling visual software or more complex granular patches, for instance. Min/max values. More precise than doing this on the software mapping side. Biopolare display option. Instead of 0 – 127, you can now display -64 / 64 as the range. That seems especially useful given that you might assign to something like pitch, or another parameter with positive and negative values. Send Program Change commands by key. Send aftertouch as channel pressure. In Ableton Live, those triggers become rather useful via mappings. Put together, you have easy control of parameters like track volumes and panning, rack macros, sends, and, via the buttons and LEDs, switches like clip launch/stop, mute, solo, record arm, monitor, and track select. You could also combine two UC4s (or UC3 and UC4, or some other faderbox like the LaunchControl XL from Novation) via scripts. All in all, this is the controller I think the UC3 should have been. Then again, I would miss those longer fader throws – and now might be a good time to get a UC3 on discount (though not from Faderfox, as he’s sold out). I will certainly immediately start saving up for a UC4 to match my UC3 and SC4. “Controllers” and “fanboy”/”fangirl” don’t usually go together, but with Faderfox, I’ll make an exception. Oh yeah, and if I ever start getting gigs and big festivals, then I’m totally getting a Versus. Or maybe a Peterfox (Faderkirn?) custom controller. I better get my EDM act together and closely study that Zac . I’ve got the laptop and, uh, some talent, though I will need that one track. A controller will come in handy, too. Have at it.